Directed by Enrique Rivero, Mai Morire is a perfect example of what one may label a "festival film". Lacking the immediacy of mainstream movies, this languid Mexican feature glides along at a glacial pace and when one character notes “time passes differently here” it is hard to disagree - despite clocking in at under ninety minutes, the dream-like film often feels significantly longer; with the astonishing views on display, however, this is not necessarily a terrible thing. Following an old-school title credits sequence, Mai Morire unfolds as an aesthetically stunning movie full of deep-focus cinematography which glistens almost mystically. We find ourselves on a boat easing it's way wistfully down a river where nature appears mythical; steam lays peacefully, ominously on top of a lake, a natural image which appears to have been snatched wholesale from an enchanted fable. 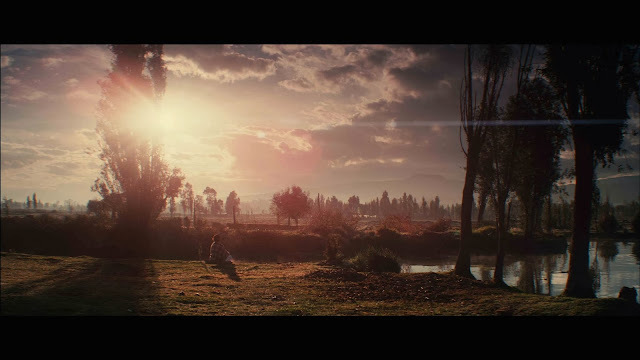 The long tracking shot which immerses us in Rivero's world is intoxicating; the camera pans round to expose more of our surroundings and we can feel the mild chill as the low sun shines and nature bleats and chirps around us. It is a captivating opening sequence which sadly marks the movie's peak. The boat, we learn, contains a Mexican lady named Chayo who has returned home to look after her gravely ill mother; despite the specter of death, there is a sublime beauty to the world around her. This, for all intents and purposes, encompasses the sparse plot and narrative minimalism on display in Mai Morire and sums up best why the feature's audience will not extend much beyond festival screenings: As the primary mode of mainstream cinema gravitates towards melodrama, there is a necessity to create films which act in polemic yet, in Rivero's film, the sparsity of action and agency on display does not just act as an anti-thesis, but also a guard. As much of the film's drama occurs in the haunting visuals rather than the plot, it is almost impossible to stumble upon an emotional reaction - the pared back nature of Mai Morire often acts like a shield and we're left to guess what emotions Chayo conceals beneath the still mask of her face or, for that matter, why we should care.